Walking and cycling have always been a part of who I am. From weekend hikes with the Boy Scouts to the infamous ride on my tricycle when I was 5 that got me grounded for a week without wheels, alternative modes of transportation are an essential component of my DNA. Working at Alta allows me to indulge in all my passions of designing for active transportation and directing my passion for "walking the talk" into all aspects of my life. 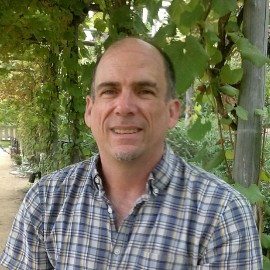 Greg Maher is a Registered Landscape Architect with 15 years of experience in architecture, landscape architecture and urban design. His background in design, project management and construction management have led to the development of strong organizational skills that keep projects moving smoothly through all phases of implementation. Since joining Alta, Greg has worked on a variety of place-making and active transportation projects located throughout Southern California. Greg lives on a 1/4 acre urban farm in Glassell Park with his husband, Tom, and their dog, Sligo.